At the Family Birth Center, we bring together a dynamic team of experts to support you through childbirth. 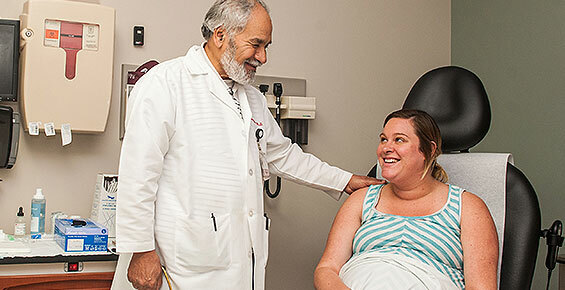 Our team provides optimized care as you prepare for and experience the birth of your newborn. 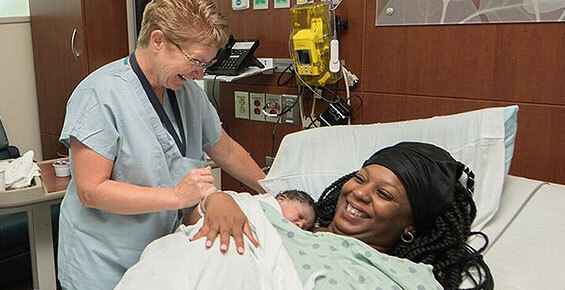 Our physicians, midwives and nurses offer personalized, compassionate care at each stage of pregnancy and childbirth — from your first visit through labor, delivery and your newborn's first days. If you or your baby experiences a high-risk complication, our maternal-fetal medicine and neonatology (NICU) experts provide the highest level of specialized care for you both. During labor and delivery, our team offers you a versatile spectrum of expertise, from midwives who specialize in natural childbirth to dedicated obstetric anesthesiologists. Our anesthesiology team is available to administer pain medication as needed or requested 24 hours a day, with advanced expertise in epidural labor pain relief. Once your newborn arrives, our lactation consultants can help you both get started with healthy breastfeeding practices. Our team offers the same breastfeeding guidance as that of private lactation consultants — before you leave the hospital. From the earliest days of your pregnancy to the moment you and your baby are discharged, our team is your team. Our experts offer world-class obstetric care, helping expectant moms navigate options and supporting customized birth experiences from prenatal care through labor and delivery. With specialized expertise in woman-centered care, our midwives offer personalized support and coaching through pregnancy, labor, childbirth and postpartum recovery. Our maternal-fetal care specialists manage high-risk pregnancy conditions with unmatched expertise, supporting the best possible outcome for mother and baby.